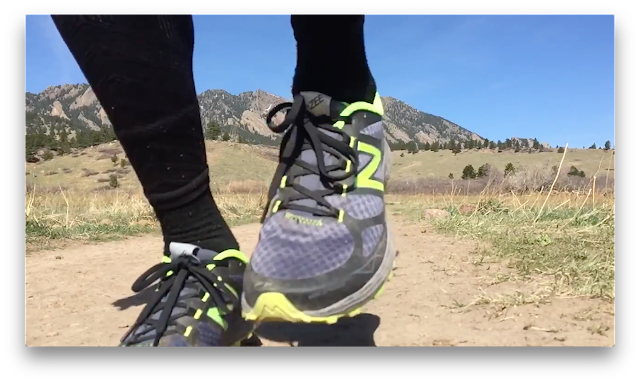 Road Trail Run: New Balance Vazee Summit Trail- Light, Fast, Protective and for less than $100, it is a steal! New Balance Vazee Summit Trail- Light, Fast, Protective and for less than $100, it is a steal! I was immediately impressed with how light the Vazee Summit felt when picking them up for the first time. They miraculously look/feel compact and minimal, yet at the same time are protective and substantial. Though my size 10 fits perfect and is true to size, the Vazee Summit is comparatively trim in relation to most of my other shoes of the same size. Though the New Balance advertised weight is 9.3 oz. for a men’s size 9, my size 10s weighed in at an impressive 9 ⅛ oz, in line with what Running Warehouse shows.. Though this is at the lower end of my weight tolerance for a daily trainer, as I typically prefer a more substantial shoe for my typical runs on steep and rocky trails, before even running in the Vazee Summit, I suspected it could easily perform double duty as a racer or daily trainer. This was one of those shoes that I put on in the house and knew right away that it was going to work very well for me, without even running a step. The single layer seamless upper is sleek, light and minimal, with well placed and supportive welded overlays that do a great job keeping the foot in place. The upper is surprisingly thin and flexible considering the amount of support it provides. The mesh is tightly woven to keep out dirt and debris, but is simultaneously quite breathable. The heel counter is sturdy and protective, while allowing just enough give to not feel at all constraining or unnessarily overbuilt. Padding in the heel is moderate, leaning toward minimal, but has just the right height, shape and density. Lacing is accurate and effective on the first try and did not require any fine tuning before or during my runs. The toe bumper is streamlined and minimal, integrating nicely with the welded overlays, yet sturdy enough to ward off all but the worst stubs. The tongue is not a tongue at all, more of a stretch mesh, bootie style wrap which improve comfort and fit, while further helping to keep out dirt and debris. Sliding into this shoe feels like putting on your favorite pair of slippers. Though this is a very small shoe in size and bulk (or lack of bulk), it fits very true to size and has a locked down heel, midfoot, with a toe box that provides just enough room for splay and swell, yet still enables a precise enough fit for good performance when pushing hard. Though I have a lower volume foot, I suspect that this shoe will accommodate a wide range of feet. I found the Revlite midsole to be on the firm side, yet offered ample cushion and protection for runs up to moderate distance/duration. This shoe is quite responsive and begs to go fast, yet performs exceptionally well at any speed and on any terrain, from rocky and technical, to buffed out single track, dirt roads and even short stints of pavement. The HydroHesion outsole complements this shoe nicely, with a soft rubber compound that very much helps smooth and cushion the ride. The lugs are generous, well shaped, well positioned and provide excellent grip on most surfaces, but are not so large and pointy as to be a liability on hardpack or less technical terrain. The rubber compound grips very well in dry conditions and on dry rock, but I found that I had to be a bit careful when conditions are wet. They held well, but not as well as a shoe with true sticky rubber. The Vazee Summit also performed reasonably well in the snow, slush and mud, about as well as you could expect from a shoe in this category, but I found it to be much better suited for drier conditions (though mud shedding is excellent). The durability of the outsole will be determined by the surfaces on which you run. At around 45 miles, I am beginning to notice some wear on the heel and forefoot where I toe off. Granted, I run almost exclusively on rocky, steep and technical trails (and spent a good bit of time off trail as well), so this is not entirely surprising, but I run all the same terrain in all of my trail shoes and wear here seems a little bit accelerated. Not a deal breaker, but something to keep in mind. If you run on less steep, smoother, softer trails, you’ll likely not notice wear until much later. I also found the heel and center of the outsole under the midfoot to be a bit narrow. 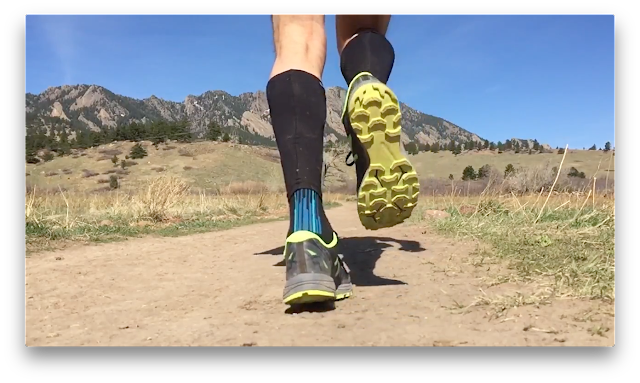 It was hardly an issue most of the time, even when pushing the pace on rocky, technical downhills, but the shoe occasionally felt a bit little bit tippy when running down or traversing steep, off camber hillsides (primarily while off trail on ~20% + gradients). Again, this was under more extreme circumstances, but I occasionally felt as though this shoe could benefit from a slightly wider platform. 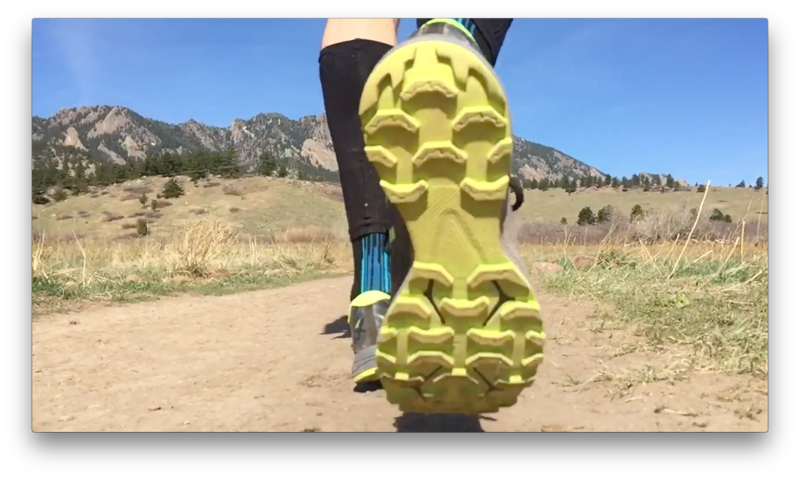 There is a nice rock plate in the forefoot which provides excellent protection from rocks and roots, yet is flexible enough to allow the shoe to contour well over rocks and other undulations in the trail and also provide a little bit of spring upon toe off. I pushed these shoes hard and through a wide variety of conditions, from fresh snow, packed snow, slushy snow, frozen snow, mud, wet rocky trails, dry rocky trails, steep off trail, buffed single track, dirt roads, pavement and the Vazee Summit performed exceptionally well at all of it. Though I found them to perform above average in wet conditions, I enjoyed them a bit more when conditions were dry. With an overall stack height of 27mm in the heel and 17mm in the forefoot (including the lugs), there is enough cushion and protection for longer distances, but I think would depend on individual preference. For longer runs (for me, I would make that cut at around 3 hours), I would definitely prefer a bit more cushion, such as the Leadville 1210, but for those used to more minimal shoes, I think the Vazee Summit could certainly hold up to a 100 miler. Though the drop is 10mm, a bit more than the predecessors of the Vazee Summit, I find it to not be an issue whatsoever (it really felt like it was about half that, but it is hard to tell when running on mostly uneven terrain). The Vazee Summit has earned a top spot on my favorites shelf, something I would grab for almost any of my daily runs and especially if I want to go fast. At under $100, I would highly recommend this shoe! Salomon S Lab Sense Ultra SG - I guess I could also add the non SG version in there too, as the lugs of the Vazee Summit fall somewhere in the middle. Both the Vazee Summit and Sense Ultra are light, fast, agile shoes great for going fast. I would say the Salomon has a more dialed in upper that holds the foot better for the utmost performance, but on longer runs, that can feel constricting. The Vazee upper, though a bit less snug, still holds very well and has enough give for foot swell, splay and all day comfort. Outsole longevity/durability is similar, traction is similar. Cushion is better in the Vazee and has a much softer feel and is more forgiving upon impact. Price is a big factor here as well, with the Vazee Summit retailing for nearly half the price, it is real value. Saucony Peregrine 6 - This shoe is the closest in my opinion, about the same weight, fit, overall feel and cushioning, protection (RTR review here). The Peregrine 6 is a bit more stiff (which is noticeable on steep ascents), but has a slightly wider outsole and feels marginally more stable. Though the Peregrine has a 4mm drop to the Vazee’s 10mm, I can hardly tell the difference. I like the better outsole grip of the Peregrine 6. I would probably have to flip a coin on these two, but again, the Vazee Summit is $20 less, so that could be a factor.